Conceptualization and definition of the project. 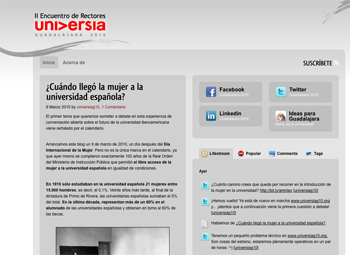 Subsequent design and programming of a blog as a central element of participation / communication for the Second Meeting of Rectors Universia - Guadalajara 2010. Using technology that allows content to pick up social networks with a presence in Guadalajara for 2010 Universia revitalization.